Casper D Dog - Hi! My name is Casper. 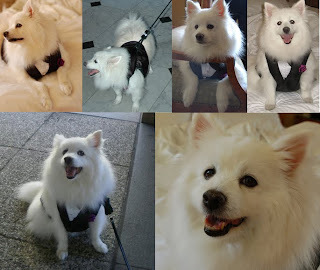 I am a mini American Eskimo Dog(Eskie). Hi there ! I'm Casper D Dog. I am a miniature American Eskimo Dog or Eskie for short. Welcome to my website! I am a fun loving little doggie. Read all about my adventures in my regular blog posts plus I have lots of pictures/videos to show you. You can also check out shirts and gift items from my shop or help us with our fundraising to help out other doggies. Love dogs? Then you will love our stuff. Check out dog breed themed shirts, mugs, magnets, stickers, license plate frames, and other gift items from my shop. Here are some designs from CasperNCaboodle. Click on each image on the left to go see the products available for each design. American Eskimo Dog Wall Calendars featuring 12 full color pages of your favorite American Eskimo Dog. Perfect for any Eskie lover. Each month features an Eskie picture with colorful borders to make each month more special. Makes a great gift item! 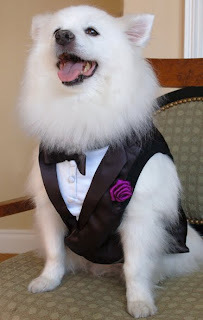 American Eskimo dogs love to have fun. Each calendar month features a different Eskie adventure! 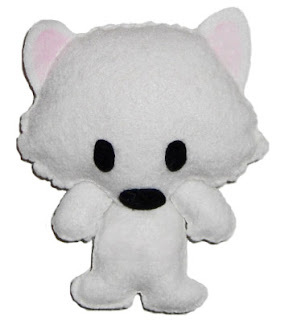 Get your very own American Eskimo Dog Doll! Stuffed with real Eskie fur! Makes a great keepsake of your beloved furchild. A unique and personal collectible for any Eskie lover. The following causes are very important to me so we have set up these fundraisers to help out my fellow doggies. These designs are available on shirts and other gift items and all commissions earned go to each cause. I was diagnosed with Evans Syndrome in 2006. It is a combination of IMHA/AIHA (Immune Mediated Hemolytic Anemia/Auto-Immune Hemolytic Anemia) and IMT/ITP (Immune Mediated Thrombocytopenia/Immune Thrombocytopenic Purpura). I was hospitalized for over a week and received numerous blood transfusions and a cocktail of immunosuppressants to save my life. I was weaned off the medications due to complications such as Cushings Disease but after a few months off the drugs, I relapsed again so I am currently back on medication. I continue to fight this disease everyday. There is no cure for this disease so please help support the fight for a cure. Meisha's Hope Fund and Morris Animal Foundation has teamed up to find a cure for IMHA with Autoimmune/Immune-Mediated Hemolytic Anemia Fund #338. Immune-Mediated Hemolytic Anemia is a serious blood disorder and scientists estimate over 50% of dogs diagnosed with it will die from the condition. Affected dogs show signs of weakness, lethargy, exercise intolerance and anorexia. This deadly blood disorder occurs when something triggers the dog's body to attack its own red blood cells. Despite aggressive immunosuppressive therapy, this disease has a very high mortality rate. Many dogs die shortly after diagnosis, so an effective early treatment is critical. All commissions earned from this design will go to the Meisha's Hope AIHA/IMHA Fund #338 at Morris Animal Foundation. Everyday, people are working together to rescue Eskies and to help them find their forever homes. Show your support for these wonderful people and organizations. 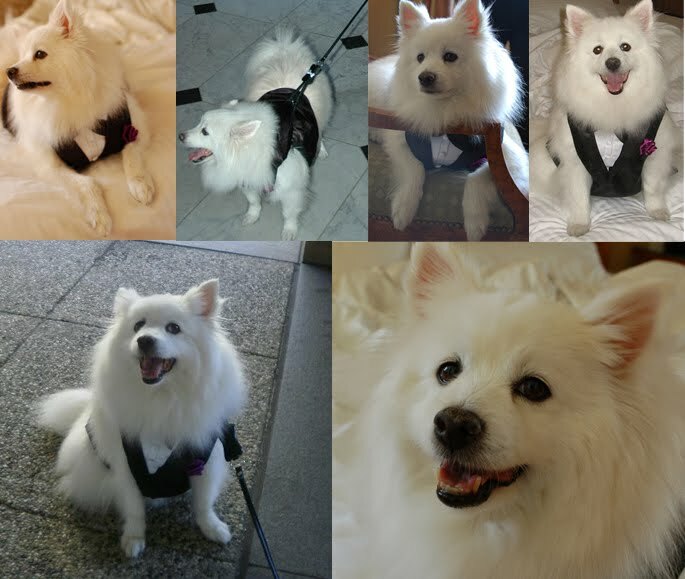 All commissions earned from this cartoon American Eskimo dog design will go to Eskie Rescue. Mommie adopted me in 2005 and she always says it is the best thing ever. Loving dogs are waiting in shelters around the country to be adopted. Opt to adopt and make a loving forever home for these poor dogs. All commissions earned from this design will go to local animal shelters. Here are some links that you may find interesting. Check out information on American Eskimo Dogs. Learn all about our sizes, appearance, temperament, grooming needs and more. Taking care of a dog is a BIG responsibility. Dogs are totally dependent on their masters their entire lives so there are a lot of things to consider. Here are some things to think about before getting a dog. I would love to hear from you. You can add comments on my blog posts or drop me a line from here anytime! I got a new book report assignment from Miss Anna at the National Geographic Society. This time it is their new book, Dog Tips From Dogtown - A Relationship Manual for You and Your Dog. It is full of great ideas for potential dog owners as well as those who already have dogs. And this expert advice comes straight from the trainers at Dogtown! I am sure they have experienced all sorts of doggie behaviors over there. Like me, they advocate adoption. There are way too many wonderful dogs out there just waiting for that right person and furever home. The book walks you through all the things to consider before adding a doggie to your household. Then goes on to basic training instructions and also some troubleshooting tricks in case you run into issues with your new charge. So even if you already have a dog, this book has useful information for you. And I really like that they stress the power of positive reinforcement. Treats, toys, pats and kind words are way better than scary angry words any day. The book is available anywhere books are sold. A portion of the proceeds from the book goes to Best Friends Animal Society. And if you want to buy my copy, contact me. We are planning to give the money from the book to Eskie rescue. I will even sign it with my pawtograph. Teehee! UPDATE: My pal Geno has offered to buy my copy. We've asked him what his favorite Eskie Rescue group is and that is where we will send the funds. Thanks Geno and for all those who expressed interest in buying the book. Casper Bond. Teehee! Here I am in my tuxedo. Mommie even made a small satin rose for my outfit so I'd have a boutonniere, too. Here is Mommie adjusting my bowtie. And a few shots of me during the big day. I even have a new harness to match my fancy duds. 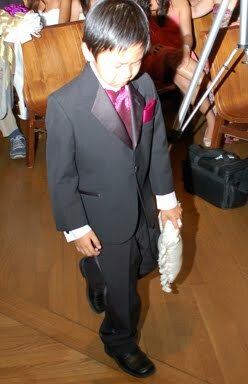 I was supposed to march down the aisle with my cousin but he got so nervous, he started crying. 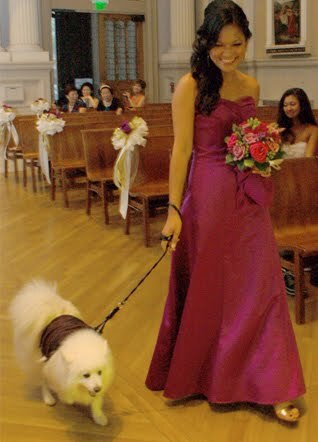 Since he was upset, he was not going to be able to hold my leash, so I just walked down the aisle with one of the bridesmaids who did not have a partner groomsman. Sigh! Grandpa has gone home. I will sure miss him. He comes to visit every year and every year I plant myself under the dinner table in front of his chair because he always has some food falling off the table. For me, it is like mana from the heavens. Mommie says it is bad of me to eat food that fell off the table but the selection is so varied and they all taste so good. Whenever somethings falls, it is a contest between me, Mommie, Auntie or Grandma to see who can get to it first. Sometimes they are able to pick it up before I eat it but sometimes I am too quick for them. One time, a whole chicken pot pie fell and landed right in front of me. I was so startled at the size of my prize, I hesitated. I could not believe my luck that such a huge portion came my way. Then, Mommie swooped down to pick me up and Auntie picked up the pie and cleaned up the floor. Darn it! That was a missed opportunity. Wow! It has been a very busy few weeks for us. We are finally starting to settle into our new family life. I am already reaping the benefits coz Dad has Animal Planet so we were able to see my pal Atka's tv debut. Things have quieted down since the wedding but the wedding stuff is still piled up waiting for Mommie to put away. She is lazy to do so and wants a break from all the wedding stuff. Haha! The big day was wonderful and I got to participate. 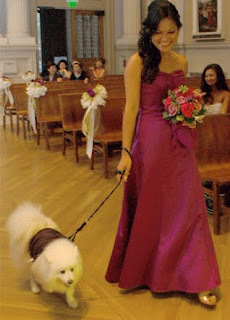 Everyone said I was the most behaved doggie they had ever met. Relatives and friends who had not met me before said I was cuter in real life. Awww shucks! I got up real early to nose around and there were people walking here and there doing stuff so I had to make sure I was in the middle of it all. It was a nice cool day so I did not feel hot in my tuxedo. Mommie even made a small satin rose for my tux. Plus she got me a neat-o harness and leash to go with my fancy duds. By the time the ceremony started I was so tired and was not up for pictures. Mommie says that is coz I did not take a nap all day but there was too much going on. Mommie hopes there will be good pictures of me at the ceremony. I hope so too. The day after I had a huge red spot on my belly. As big as a nickel! It started to fade the next day so all is well. Whew! Uncle gave them a trip for their honeymoon so they were gone for a few days. My new Grandma took care of me. We had a good time and played ball and watched tv. They would call every evening to check up on us but we were doing fine. Grandma spoiled me with carrots. Yumm! She made sure there were always cut up carrots in the refrigerator ready for me to eat. And I took care of her, too. She has nasty nightmares and I made sure to wake her up when she had an episode. And I made sure she let me out to potty before she left the house. When Mommie came home, I would not leave her side. I followed her around the house all day. But when she goes to work these days I say goodbye from the top of the stairs and when she closes the door, I run back up to be with Grandma. Thanks Steve/Chris, Kari/Steve, Sue/Steve/Siku/Quinn for the gifts. Mommie and Daddy love the house stuff but I especially enjoy the cow stuffie. Hmmm, it seems most every Dad's name is Steve.